Short version: We’ve moved! Still living just outside Durham, NC. The old place, 24 hours before the movers were supposed to show up. This might not be a big deal up in Boston, but here in North Carolina this might as well be four feet of snow. Everything was shut down. 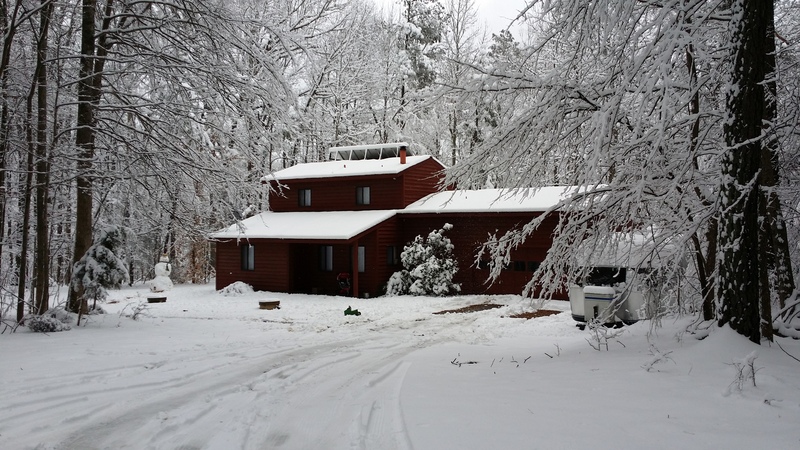 I won’t bore you with the details, but let’s just say that you have to move house (and Airstream-based saxophone repair business) in North Carolina, follow my advice and don’t do it the day after 8 inches of snow falls in your ill-prepared state. Things that normally happen during a move from one rental to another- like the previous tenants getting all their stuff out of your new place, cleaners cleaning, trash service running to pick up the junk at your old place, plumbers plumbing, movers showing up, Airstreams not being stuck in the ice- these things do not go well. And if in addition to the previously mentioned issues you also have two small children, let’s say of ages 10 months and 3 years- just burn it all down instead. We did not follow the above advice, but at least now are comfortably situated in our new digs (much larger than before- so much room for activities! 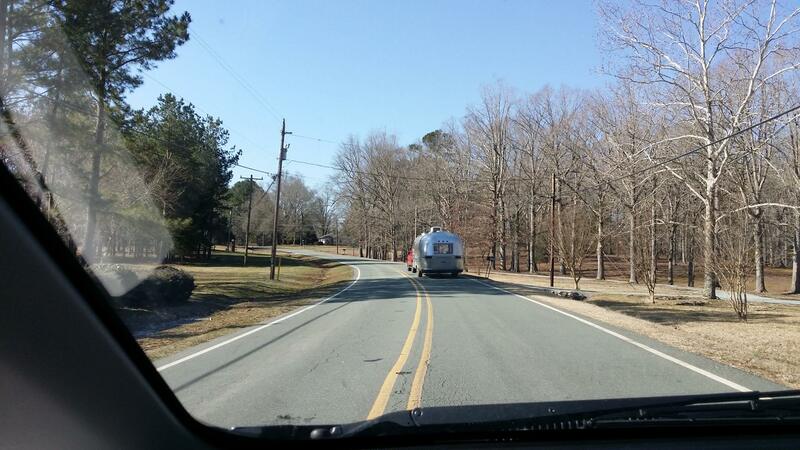 ), the Airstream is moved and up and running, and I’m back at work. Trundling up the old driveway, my heart was in my throat. This is one week after the photo with the snow. Just another mile or so to go… seems like this could work! 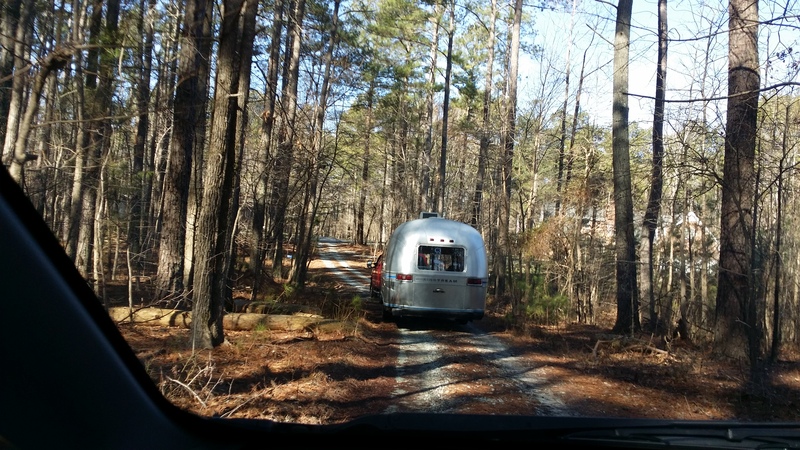 The Airstream actually moved extremely well and easily- well other than the first moving appointment being impossible due to a completely iced-over uphill driveway at the old place. I had been extremely nervous about moving the Airstream, and indeed the closer the move got the less confident I felt about my Big Idea of putting my shop on wheels. But when the time came, it was as if it was the most natural thing in the world to do, and it only took about 45 minutes from pulling up at the old place to the truck driving away with the Airstream set and leveled at the new place. Of course, the new place was only a few miles down the road from the old place, but still! As I had been telling people about the impending move of the Airstream workshop- I’m either going to feel like a visionary genius or the world’s biggest dumbass, and I’m happy to report it turned out to be the former. It was so easy I kept waiting for the other shoe to drop, but in the end it just went down the road and parked at the new place like, well, a travel trailer should. Set up time was about 3 hours (my hand tools and shelves and pad cabinets and so forth, only the benches were bolted down), and I was sitting in my workshop set up just like before so quickly it was quite jarring to look out the window to see a completely different view. It still feels odd, and I guess I am just surprised my idea of making a shop I could move with me when I moved house worked out so well. The new digs. I plan to build a small deck in front of the door with an Adirondack chair or two for coffee breaks. A far cry from my peeling-paint and flyblown closet in Times Square, that is for sure. The view, by the way, is marvelous. That pond in the background is full of fish, and I full intend to spend many a weekend day down there with my son pulling out a few bass. We are also walking distance to a river, where I can see a lot of summer swimming getting done. And true to North Carolina weather patterns (or lack thereof), while it was 17 degrees last week it is already in the 60s this week and the daffodils are blooming. Spring is on its way. Also, I got a new lathe, a little itty bitty Taig. I went to the trouble of moving the old lathe to the new place before figuring out it was just too heavy to comfortably put in the Airstream. So I’ve got a super heavy duty lathe bench I built in the Airstream in expectation of using the old lathe on it, and instead I’ll be putting one of the smallest usable lathes on it! The bench weighs probably 4 times as much as the lathe and all of its accessories. At least I’ll have room for a small milling machine. Any recommendations? 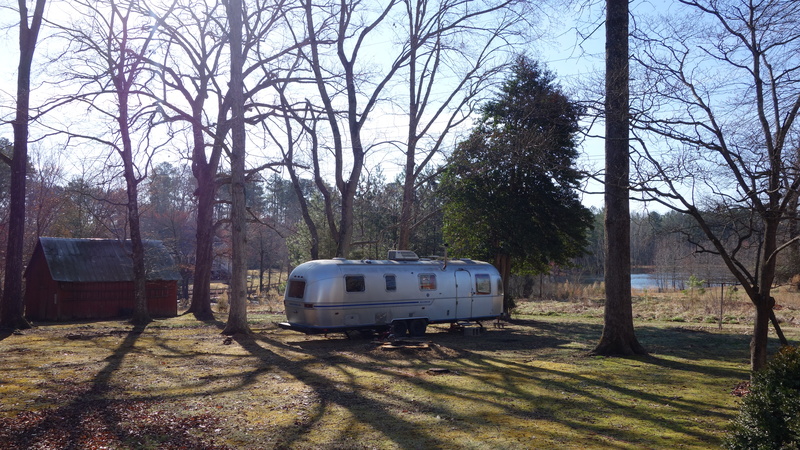 I’ve renovated the Airstream a bit including a couple new benches and moving my dentwork station inside, and after a few more things I want to get done- a deck outside of the front door, a built-in couch in the front under the curved windows- I’ll post some new photos. It looks quite different from the photos in my gallery, and I’ll have to update that gallery in a month or two when renovations are complete. Also I’ve finally fixed and gotten the “On The Bench” section of this website under control. Look for a post every week or so, with some photos and a little writeup of each major or interesting job I complete. Another thing that has happened recently is I have mostly removed myself from Facebook. It was simply taking up too much of my time- or I had allowed it to- and I want to put out a lot more content on youtube and my websites this year than I did last. I put out a lot of content on Facebook, but that was to a limited audience and I don’t think it is in the best interest of the future to put information behind the wall of Facebook. So I’ve got lots of videos in the pipeline and I’m working on articles again, and I plan to spend a generous amount of time on the opensourcesaxophoneproject.com website to bring it up to a moderately useful level. So! Here we are, set up in the new place, and life can get back to the new normal. At least for another couple years until we are ready to buy. Got any rural land to trade for a saxophone? Give me a call. Anyways, I’m back to work. I am not accepting any new clients at this time as I work through my overhaul waitlist in addition to continuing to do a good amount of work for Getasax.com. I’m a lucky guy to be so busy doing what I love, but I do apologize that it can be a pain to get your horn in to see me! It doesn’t take many overhauls to keep me busy for a full year- maybe about 45- so I become booked quickly. At least I can say I usually pick up the phone, and those of you that have called me with questions can attest I do at least give long answers, if not thoughtful ones. So that’s the news, thanks for reading and thanks to all of you for being so supportive during the move.